Objects of Desire: Style for the Garden and Home will kick off with a festive Preview Party on Friday, May 31st from 6:00 to 8:00. The event will give guests an “early bird” opportunity to browse and buy mid-century, antique, contemporary, one-of-a-kind garden accents, fine furniture, found objects, art and accessories, beautifully presented by 25+ top dealers, all while enjoying delectable fare by Barcelona Restaurant. Tickets are $125 per person. 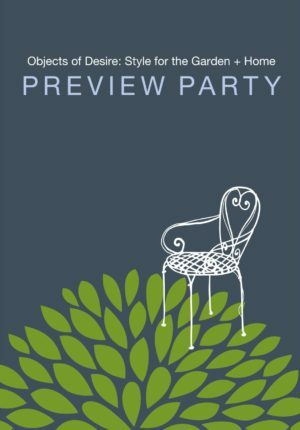 New this year – come to a very special VIP Reception hosted by Design Chair Phillip Thomas, before the Preview Party! Get exclusive early access to shop the show, design advice from the area’s most talented interior designers and in depth information from knowledgeable dealers. $250 per person, includes Preview Party admission. “All proceeds will directly benefit the Historical Society and help support our mission: To shine a light on the making and meaning of history though Wilton’s stories and historic preservation,” said Janet Foster, President of the Board of Trustees of the Wilton Historical Society.